There’s much wisdom in the old maxim, “If it ain’t broke, don’t fix it.” Readers of Promethean Times will know that we subscribe not only to this aphorism, but also its corollary: “If it is broke, the best course of action is immediate panic.” We favor blind, unreasoning panic over most other varieties of temporary fear-based madness. When a 15 year-old girl died of a suspected drug overdose after attending the 14th annual Electric Daisy Carnival at the LA Memorial Coliseum, authorities scurried into action. The obvious solution was to prohibit further raves at the Coliseum. 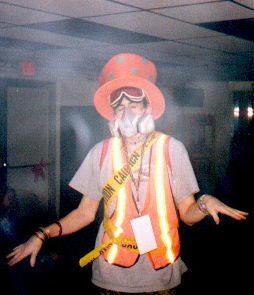 Starchyld Von Asskandy (Pictured Above) Says Most Ravers "Will Not Tolerate Illegal Drug Use." Promethean Times applauds the decision to ban raves at the Coliseum. Although the young girl’s accidental death appears to be an isolated incident, the danger remains that if unchecked, an incident like this could blow open the doorway for drugs into rave culture. This would be a pity. In 2010 there are very few places a young person can go where drugs aren’t a constant temptation. For many years, raves have been just that kind of environment, and now a few bad apples seem hellbent to sully this wholesome activity. The ban on raves in the Coliseum will have two positive effects. First, it will send a strong message to the one percenters in the rave community that these kinds of shenanigans won’t be tolerated. Drugs have already ruined Rock & Roll; we mustn’t let them sully the soulless electronic chirp of techno. The second result will be even more profound. With no more raves at the Coliseum, the attendant drug problem should trickle away. The ban will also give pause to ravers who might be thinking about trying illegal drugs. Critics of the ban charge that these young people will simply take their party elsewhere. This is unlikely. The promoters of such an event would be breaking several laws, as well as jeopardizing the health of children. The notion of an illegal, underground rave is pure fantasy. This Young Fellow Is Tuckered Out From All That Dancing. Some People Just Have To Ruin It For Everybody: Teenage girl dies of suspected drug overdose after attending weekend rave at L.A. Coliseum – latimes.com. That poor, poor, tuckered-out young fellow. Dancing his sweet little heart out. I know–It makes Smaktakula harken back to his own days of carefree innocent youth as a carny. News on the wire is that Paris Hilton didn’t do any drugs, but was with friends that did. See? When a nice young lady like Ms. Hilton falls for the seductive lure of the sweet, sweet cheeba, can there be any hope for the rest of us?